You are now reading "Indication Specific Pricing as a Pathway..."
Currently, drug prices are set for treatments irrespective of patient benefit. The call for an improved pricing system based on value is gaining attention in areas such as cancer treatment and HCV treatment. Indication specific pricing (ISP) offers a potential pathway for maximizing the value of a drug across its different uses. This is particularly relevant for cancer drugs, of which 50% have more than one indication, according to an IMS analysis. Inefficiencies in pricing arise when value varies across a drug’s indications. In the article from the Journal of the American Medical Association, Dr. Peter Bach proposed to solve this issue by linking a drug’s price directly to efficacy for each of its indications. This scenario is analyzed in the table below. A subsequent in-depth assessment by ICER highlighted practical and operational considerations for implementing ISP. A recent critique by Amitabh Chandra and Craig Garthwaite makes the case that indication-specific pricing could lead to unintended consequences, particularly in instances where a large number of patients effectively subsidizes a lower price for an indication with higher value than their own. Bach, Peter B. 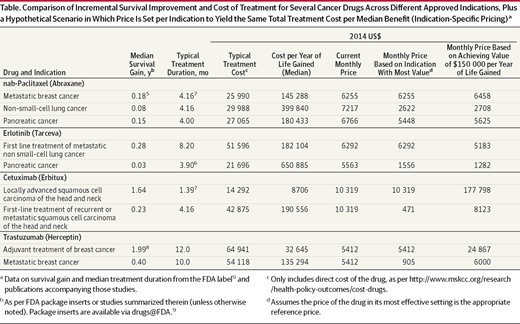 “Indication-specific pricing for cancer drugs.” JAMA 312.16 (2014): 1629-1630. Chandra, Amitabh, and Craig Garthwaite. “The Economics of Indication-Based Drug Pricing.” New England Journal of Medicine 377.2 (2017): 103-106. Pearson, Steven D., “Indication-Specific Pricing of Pharmaceuticals in the United States Health Care System: A Report from the 2015 ICER Membership Policy Summit.” (2016).